Happy Memorial Day! Today we celebrate and remember those who have fought and died for our freedom! We do live in an awesome country. 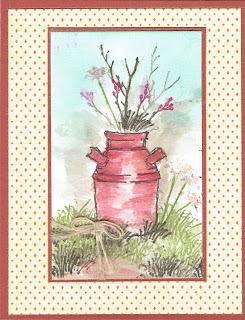 This card is created with a couple of Technique Junkie stamps - Falling Flowers http://techniquejunkies.com/falling-flowers/, and America Beats True - http://techniquejunkies.com/america-beats-true/. I used red Art Anthology Gel Medium to paint the flower petals. I allowed that to dry well and then sprayed a light blue Art Anthology Colorations spray over the card. Then I quickly wiped off the excess. Since the gel medium resists the Coloration spray the spray wipes up easily off of the red petals. I mounted it on red then blue stock before adding the embellishments - except for ribbon being tucked around the red layer. The focal image was colored with Copic markers and a matching blue was sponged on the surrounding areas of Lady Liberty. 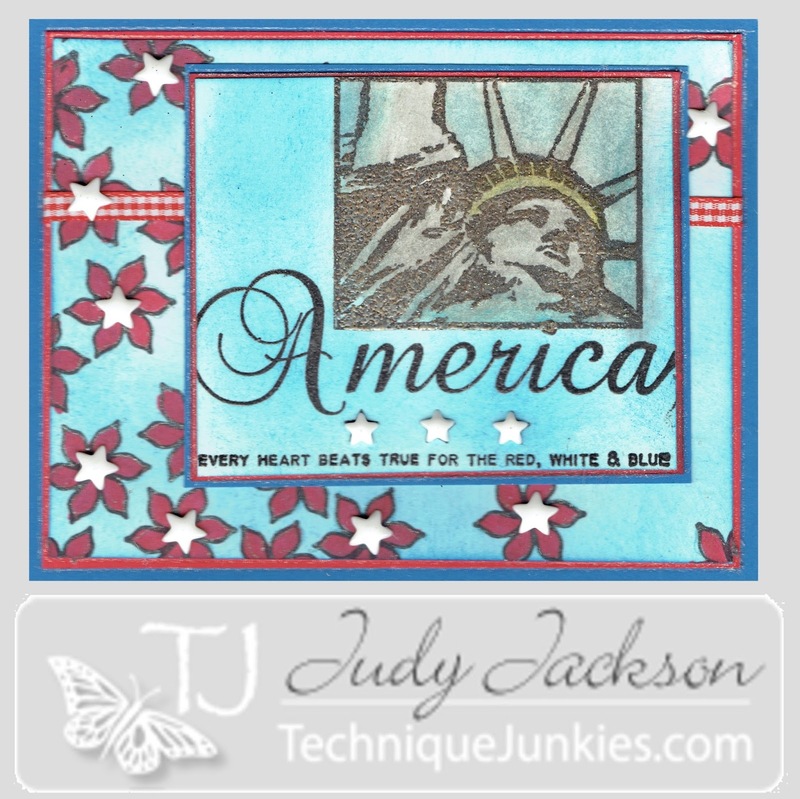 After this imaged was layered with red and blue card stock, Little white stars were adhered to the center of the flowers and under the word America! This card shouts patriotism! Have a great day and get inky! Lots of times, people look on Pinterest for new ideas. 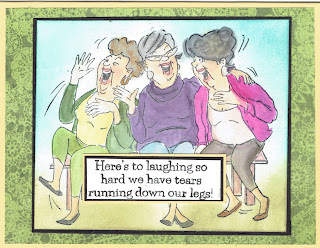 While I have done that some -- it has been very little, I do read blogs and get ideas for cards there. Back in February I visited cousins. And my cousin, Doris, got this idea from Pinterest, but i have no idea where. 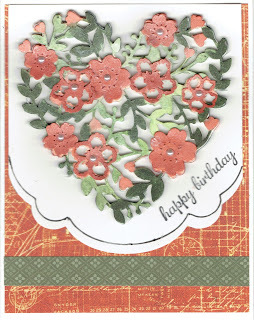 So we both made this card from Stampin' Up stamps. Lots of layers and lots of cutting. Most of the leaves are "fussy cut" and adhered on with various adhesives including dimensionals. Enjoy your day and get inky. Are you like me in this way? Sometimes I stamp an image and donot seem to be inspired at that moment. But then later on as I keep looking at the stamped image sitting off to the side on desk, I pick it up and start to work on it. 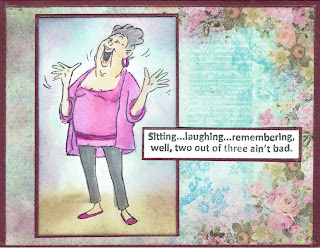 That happened tonight as I was working on some other cards for the Technique Junkie Stamps June Release. I picked up this Technique Junkie Stamps March release called French Bicycle Collage http://techniquejunkies.com/french-bicycle-collage/. I used Copic markers and lots of sponging. I swirled brown ink around the edges bringing in the color past the tire edges. Then I applied blue in the center. I added a heavier sponging on the edge of the focal image. 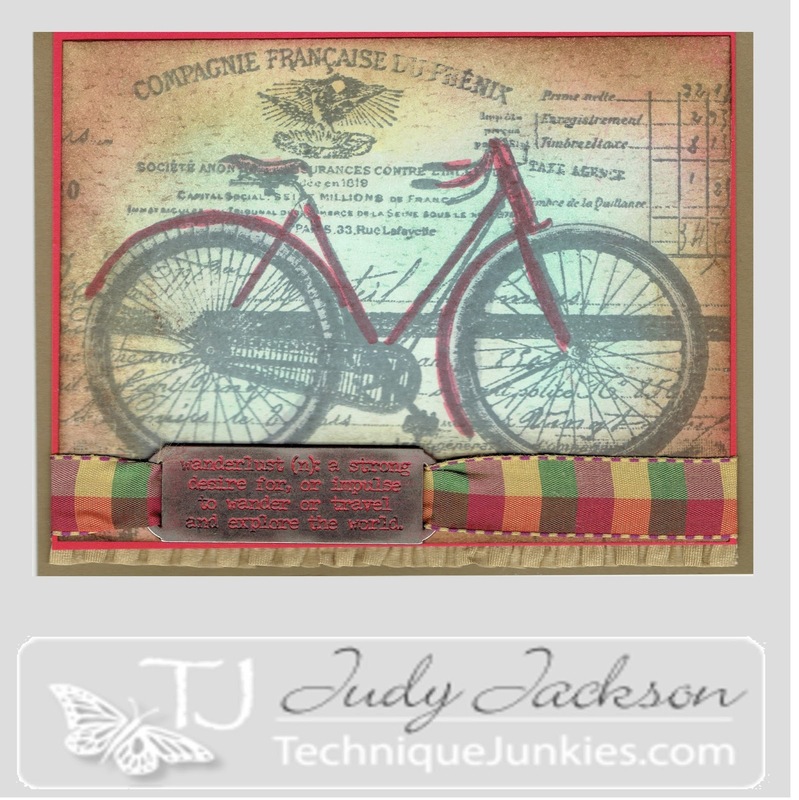 Since the bike frame is red I knew that I would layer this focal image or red card stock. So I also applied a very light sponging with red ink on the edge of the focal image. I add a brown ribbon ruffle on the bottom of the card. I decided it need some other embellishment so I looked at some new Tim Holtz metal ribbon slides I had recently purchased. I thought this went well with this image. To highlight the letters in the metal ribbon slide i sponged on paint from Festive Berries Distress Paint daubers and let it sit for a few minutes before wiping off the excess paint on the metal surface. The final layer was on the brown base card. I used Art Impressions stamps and dye based markers to create this scene. The sky was sponged in with blue ink. I used the markers direct to rubber on the stamp. Then I used a paint brush and a teeny tiny bit of water on the brush to pull out the color and yet still leave the darkness of the line from the stamped image. My husband's oldest sister turned 90 just a few weeks ago. This was one of the cars I made for her. The heart is a die cute from Stampin' Up. The greens and deep coral flowers were painted from both ink from the stamp and from reinkers. When I think of sunflowers I often think of farms and farms make me think of chicken wire. So I used 2 different Technique Junkie stamps on this card. The background chicken wire is found here - http://techniquejunkies.com/chicken-wire-2/. And the sunflower stamp can be found here - http://techniquejunkies.com/face-the-sunshine/. The image is colored in with my Copic markers, Then I went over the petals with the iridescent Smooch paint that has the pink cap/handle.,I used Smooch paint to highlight the letters as well.. I was surprised when the iridescent Smooch paint gave the petal a hint of blue. But it also worked with others colors I used. When I was in Florida visiting my hubby's cousins I stamped a lot. She stamps, and he was away part of the time on business, and we thoroughly enjoyed stamping together! One of the stores we visited had these ladies for sale. And I bought them. We also found a bunch of background paper stacks on sale and we bought those too. These are all just birthday or thinking of you cards for those ladies within a certain chronological maturity. Where I live we have had a ton of rain lately. And we now have a ton of dandelions and all of the seed fuzz on top! I inked up this dandelion seed fuzz with white pigment ink and heat embossed with white powder. The stems were colored "direct to rubber" with markers. And the sky was sponged. I found this background paper in my stash and thought the colors were perfect for this card. Time has a way of fleeting by -- so we must work toward fulfilling our wishes before life is just weeds! Have a wonderful day!And please get inky! 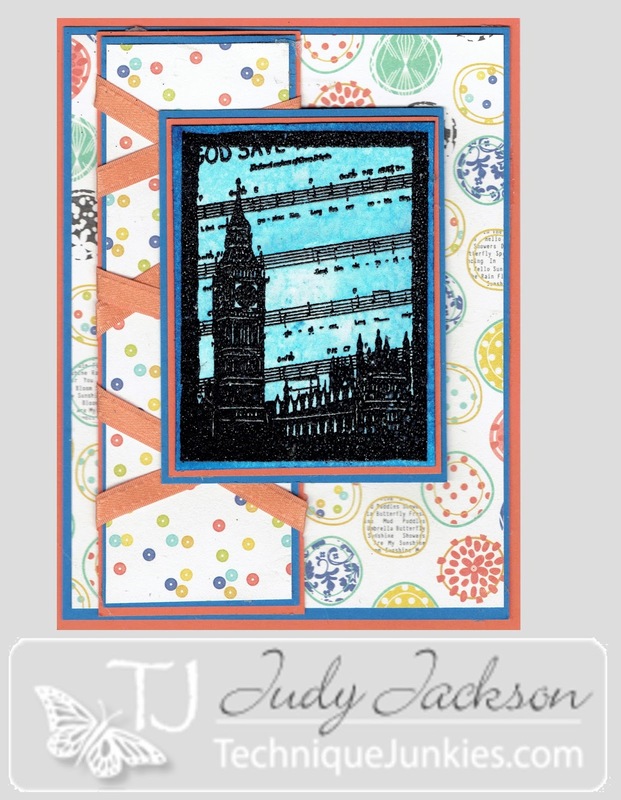 This London ATC Technique Junkie stamp (http://techniquejunkies.com/london-atc/) is just lovely. I heat embossed it in black and then added some beige coloring in the background. The verse Behave Yourself (http://techniquejunkies.com/behave-yourself) is tamped on vellum and then the edges were torn. The verse is also heated embossed in black. I adhered it to a pale olive green and then torn the edges of the green card stock. I layered all of the layers on some background paper of a city map. I love country and I enjoy using those types of things in my home. I have a quilt that is very old - hand quilted in 1895! The mother of a very good friend of my mother quilted that quilt. When my mother's friend died - my mother was given four quilts made by the mother of her friend. My three siblings and I each received one. It is a treasure to me. However, I do not quilt. I love the look of quilts. I love the heritage of quilts. I totally dislike the sewing of a large quilt. I have made several baby quilts. I have made one large quilt and I will never again make another large one. I need satisfaction from making a creative project sooner than it takes to make a quilt. And that is especially so if the quilt is made up of tiny pieces. But now -- a paper quilt. I can do that! I enjoyed making the above paper quilt and I thought the verse on the Technique Junkie stamp Fairest of Them All (http://techniquejunkies.com/fairest-of-them-all/) went with this perfectly! I heat embossed the saying and added color with my Copic markers. 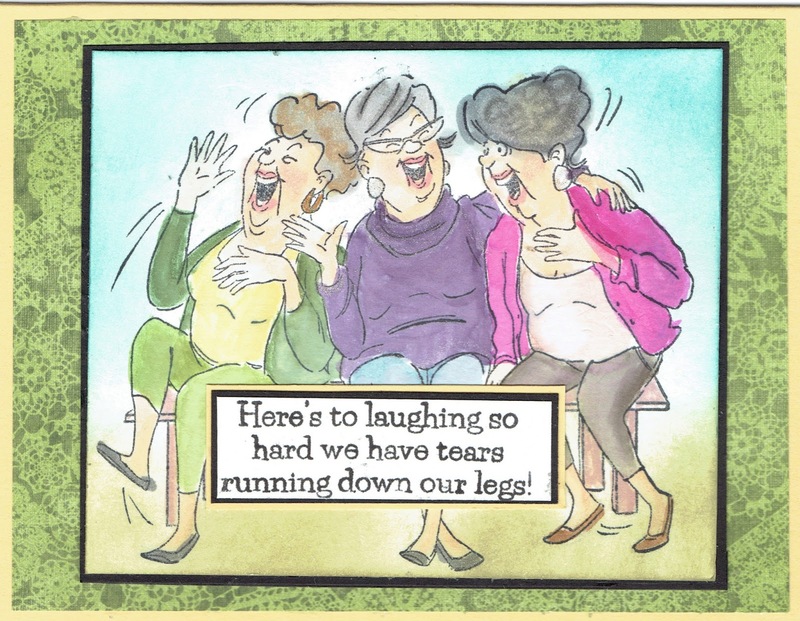 Enjoy your weekend -- and get inky! Falling Flowers is another Technique Junkie May Release stamp - http://techniquejunkies.com/falling-flowers/. I turned the stamped image on its side. I painted the yellow petal with Art Anthology Gel Medium. Then I added a tiny amount of Diamond Glaze in the center of each flower and added a few Prills in the center of each flower. 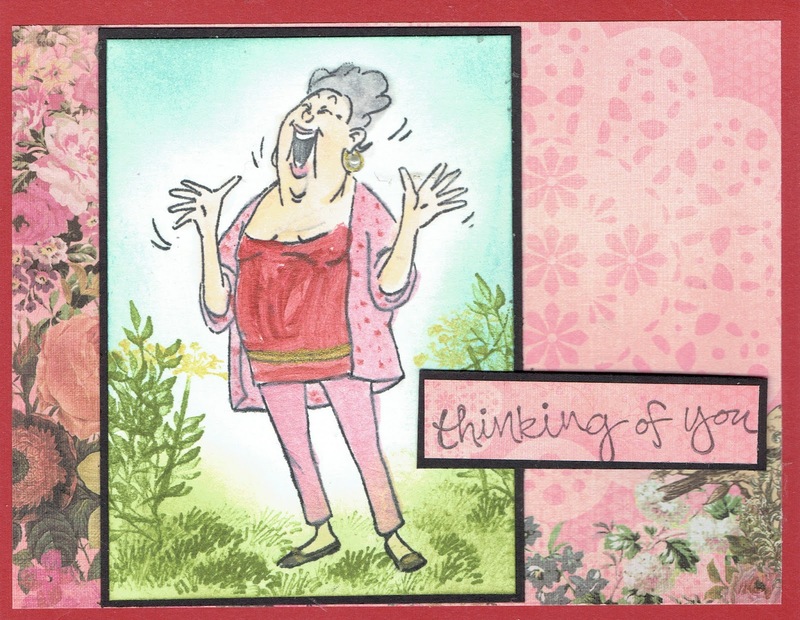 After that was completely dry -- only a few minutes -- I sprayed Art Anthology Colorations spray all over the card. Quickly I wiped off the excess with a paper towel. Since the Gel Medium acts a resist, this was relatively quick to do. The next Technique Junkie May release stamp featured here is Fairest of Them All - http://techniquejunkies.com/fairest-of-them-all/. I used my Copic markers to add color here and there on the stamped image. I used Diamond Glaze on the glass of the mirror to give a special dimension to the image. Then I sponged a very similar ink to what I used in the Colorations sprays on the background behind the letters and the mirror. Please remember the 15% sale is still working -- until May 8th! For those who know me well -- they know I love flowers - flowering bushes, flowering trees, bulb flowers, annual, perennials, and especially "winter over pansies!" I have silk flowers in my house so I can have flowers all of the time. My only regret regarding flowering trees is that they last such a short time. So I try to space them out. I have this lovely dogwood tree that bloomed after my Weeping Cherry tree, and in August I have a Crepe Myrtle! But then if those trees and bushes bloomed all of the time we wouldn't appreciate their blooms as much.And if the apple, cherry, pear, peach, and veggie blossoms didn't change we would miss out on all those yummy things to eat. So I will be grateful for the blossoms when they come. And my Dogwood tree is in bloom as I write this in late late April. We had had a hard winter with lots of snow --and that is hard on a dogwood tree. So my whole tree is not in usual full bloom. And these trees tend to be on the smaller side anyway. So this is the top part of my tree. And here is my card. Do you see how the blossoms match? This is a beautiful Technique Junkies May Release called __________________ - _________________________. 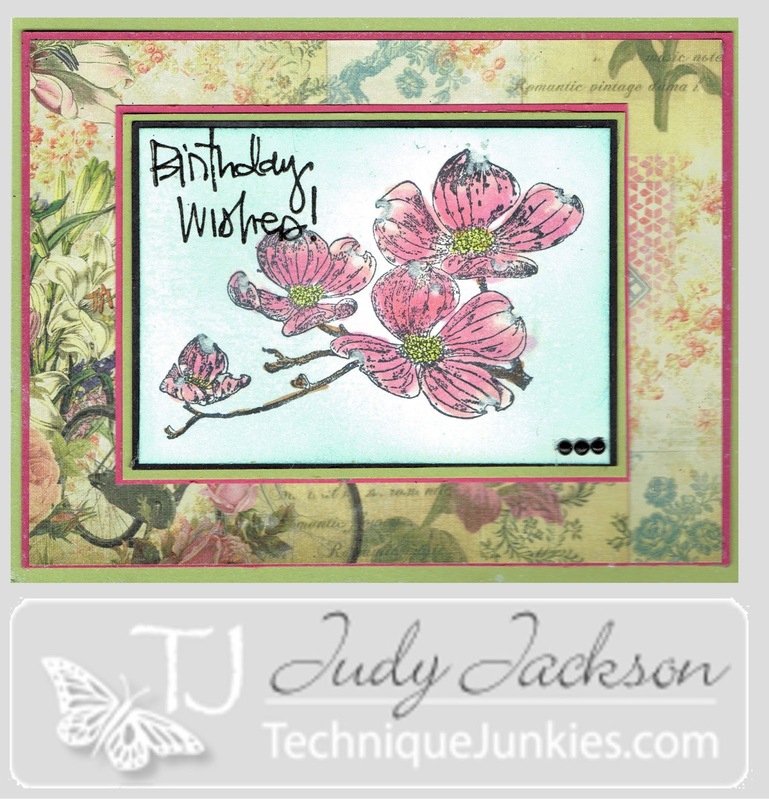 And the Birthday Wishes stamp just goes with this card -- http://techniquejunkies.com/birthday-wishes/. Quite fun and whimsical. I used my Copic markers to color the image and sponged in the sky. And don't forget the Dogwood Branch stamp http://techniquejunkies.com/dogwood-branch/ is a Technique Junkie May 'release and is on sale for 15% off until May 8! So go shopping -- it's a sale already! And if you did not read my blog post from yesterday's Blog Hop - I have a contest on my blog. So please read it at http://judysstampart.blogspot.com/2016/05/oh-merry-merry-month-of-may-and-new.html and please a comment before May 5. 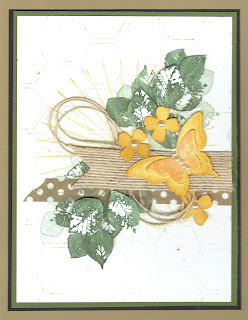 Oh The Merry, Merry Month of May - and New Stamps and a New Sale! 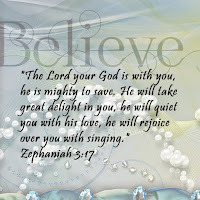 So here it is again -- the first of the month and another wonderful Blog Hop for Technique Junkies. The place to start is here - www.http://techniquejunkies.blogspot.com/2016/05/may-blog-hop-new-stamps-new-inspiration.html . 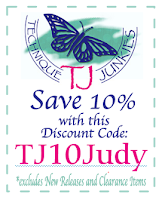 All May Technique Junkie Release stamps are on sale for 15% until May 8 -- so don't delay, go shopping and choose YOUR new stamps from the Technique Junkie Stamps May release found here - http://techniquejunkies.com/may-2016-release/. For some strange reason Blogger isnot working correctly today. So if you come across any links that don't seem to work, please the Design Team has tried hard to correct everything -- and in some cases to no avail. Please just copy the link and paste it into a browser. If that still doesn't work right, then click on the HOME button in their blog and it will take you to today's post. Please be sure to read to the very end of my Blog post today as I have a contest for you. Read and see what you will need to do to enter the contest. ATC (Artist Trading Cards) sized stamps are fun to use. 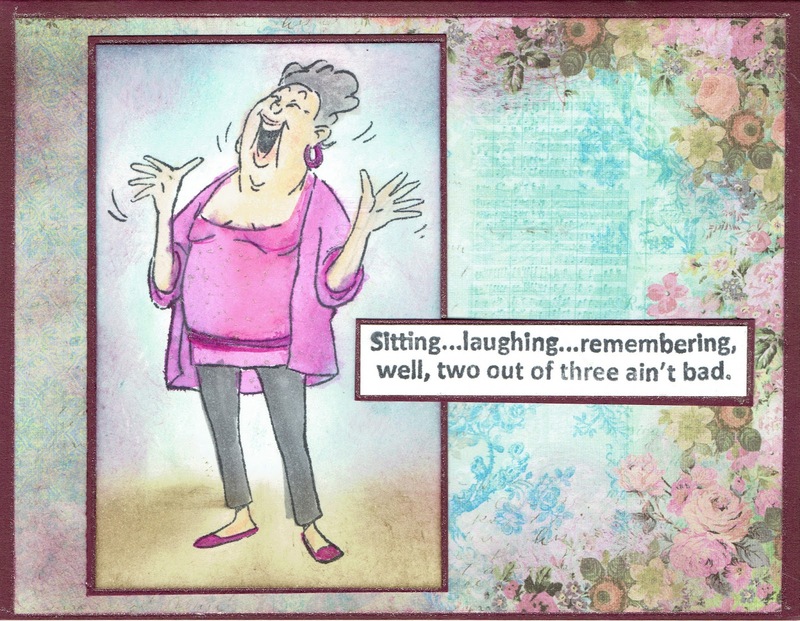 You can use them on an ATC of course, but they are also useful as a focal image on a card. 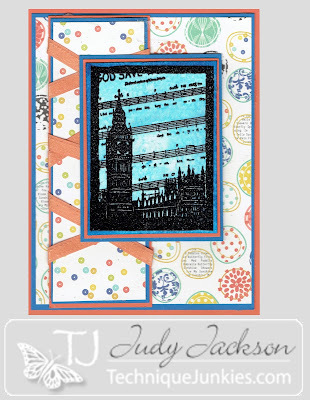 For this card I used the new Technique Junkie Stamp London ATC - found here http://techniquejunkies.com/london-atc/. I stamped it in Versafine black ink and covered it with clear embossing powder. Then I spray Art Anthology Colorations over it and quickly wiped off the excess on the embossed sections with a paper towel. Lots of layers on this card and lots of ribbon. It is just a fun card to show case this terrific stamp! My dog wood tree is about in bloom. When I was much younger I remember dogwood trees as only have white flowers. Now I know they come in a very different color. But this one is white, with rusty brown at the tips. This is of course, a Technique Junkie May release stamped called Dogwood Branch - http://techniquejunkies.com/dogwood-branch/ . This fun Technique Junkie Stamps saying is called Keep Calm and Behave Yourself - http://techniquejunkies.com/behave-yourself/ . And this Kansas gal like sunflowers. So I really wanted to do a good job on this sunflower which is a Technique Junkie May Release called Face the Sunshine - http://techniquejunkies.com/face-the-sunshine/. It is stamped with Memento black ink and then colored with Copic markers. I added a little color to each space within the letters. There is Sponging all over for the sky. Then I used a a clear liquid glue and added copper Roxs for the seeds. And now --for the background. 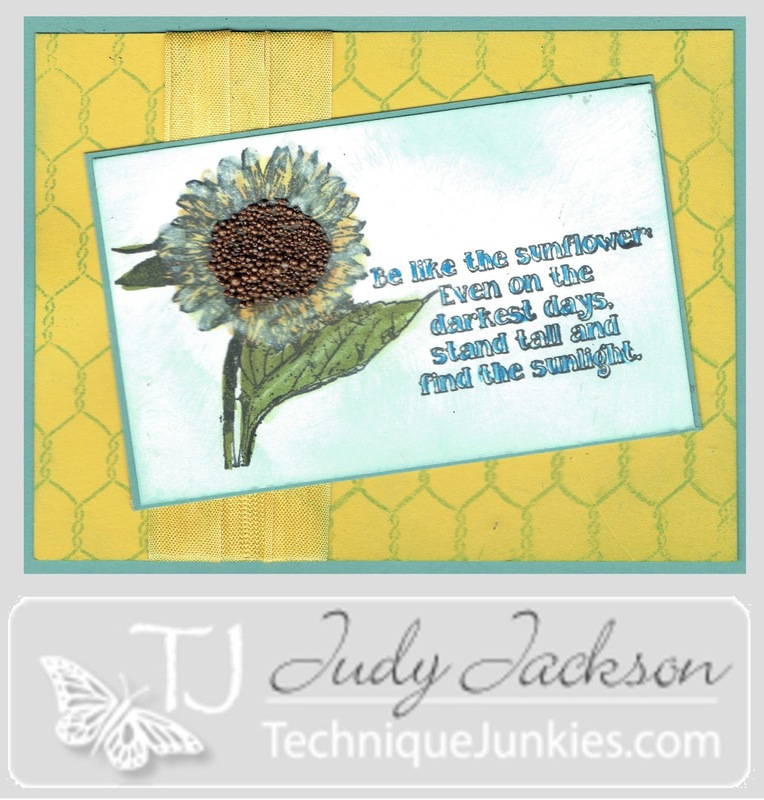 I wanted to use the sunflower and not the words on card stock behind the focal image. So I VERY, VERY carefully used my craft scissors and cut between the letters and the sunflower to separate them. And it worked! Now I have two stamps! These two stamps remain like a puzzle so that when I want to use them together they are like a puzzle on my acrylic block and will perform as though I never cut them apart. This is a fun card at this time of the year. Dandelions seem to be everywhere. Children everywhere seem to delight in blowing the seeds of the dandelion puff ball - much to chagrin of every person out there trying to get rid of dandelion weeds. 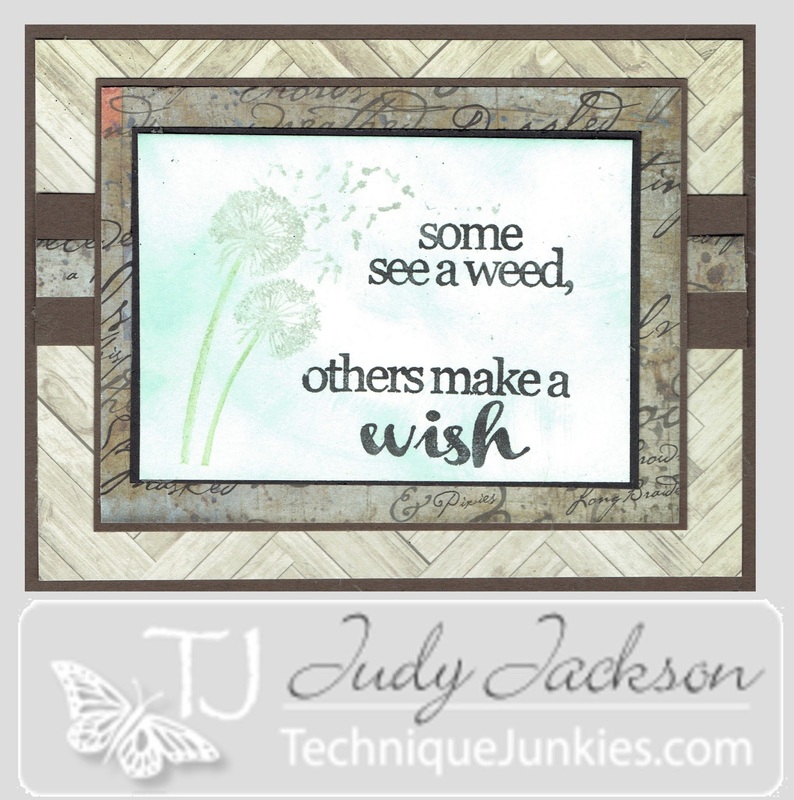 This delightful Technique Junkie stamp is called Weed or Wish - http://techniquejunkies.com/weed-or-wish/. To create this look of the soft puff ball, I carefully inked only the flower puff and blowing seeds with Versamark ink. Then I used markers directly to the stamp and over the Versamark ink. Then I inked up the words with Black Versafine ink. I stamped it all on white card stock and covered it with clear embossing powder and heat set the powder. Then I sponged on blue for the sky. I used a variety of background papers and solid card stock to create texture interest in the layers on the card. And now for the contest. 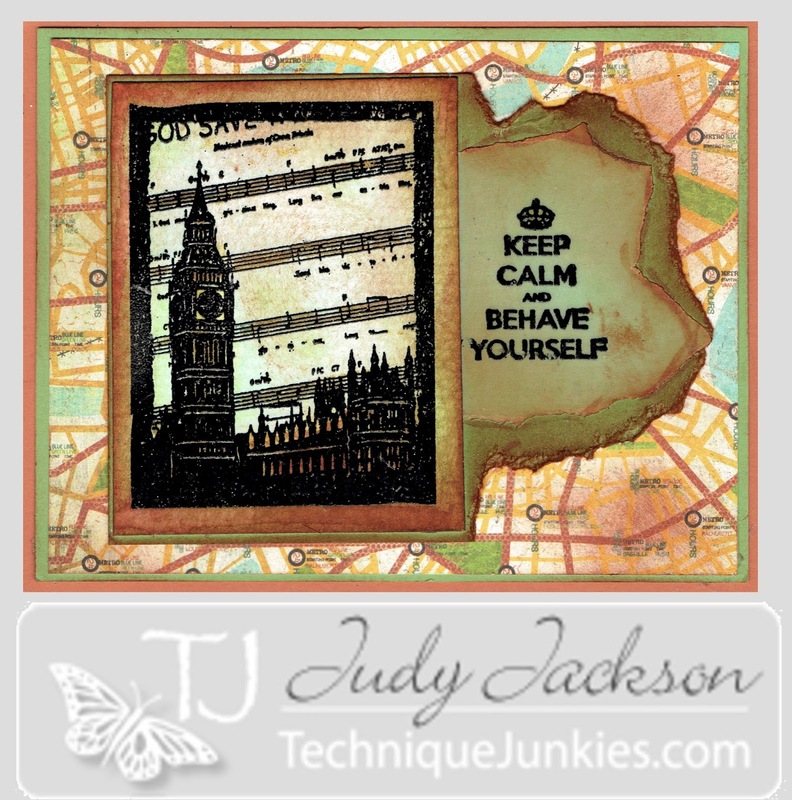 One person who comments on my Technique Junkie May Release Blog Hop post will win ONE of the above cards. Any one may win. Please make your comments before May 5. On May 5 I will draw one name as the winner and contact you for your snail mail address. Let me know 2 things: 1. which card you like the best AND 2. which new Technique Junkie May Release stamp you like the best. And your favorite Technique Junkie May Release stamp does not have to be a stamp I used. Quite often I can tell the email address of the comment writer but not always. So to be sure I can find your email address, you might want to put your email addy in the body of the comment. Please do it safely -- write it like this: janedoe at yahoo dot com. If I cannot find your email address, then you cannot win. Now -- on with the HOP!! Begin the hop at the tip of this list and hop on! Enjoy the day and enjoy the HOP! 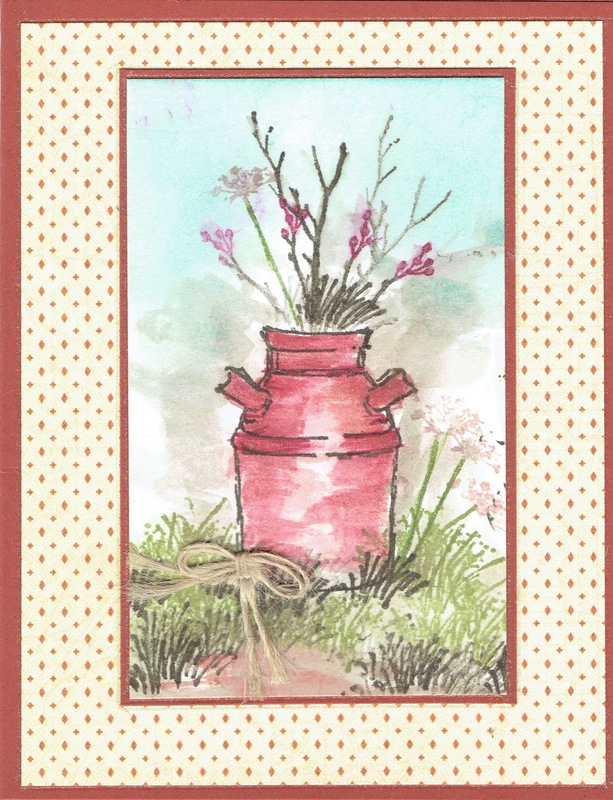 You will hop to Tonya Davidson's blog after me -- http://stampintonya.blogspot.com/2016/04/mays-new-releases.html .